It’s not easy being vegan. People always think you eat bland and boring meals. Although, being vegan doesn’t mean you need to compromise on flavour as this punchy pasta proves. Roasting brings out the natural sweetness of the pumpkin, while the peas bring a creamy element to this dairy-free dish. Delish. Pre-heat a fan forced oven to 220°. Cook McCain Diced Pumpkin and McCain Peas according to packet instructions. Place cooked McCain Pumpkin onto a lined baking tray, drizzle with olive oil, season with salt and black pepper and sprinkle with a pinch of raw sugar. Roast in the oven for 15 minutes, turning halfway, or until golden. Meanwhile, bring a large pot of salted water to the boil. Once bubbling rapidly, add pasta and cook until all dente. Drain pasta and return the pot to a low heat. Add oil and chilli to the pot and cook stirring, for 1-2 minutes or until fragrant. 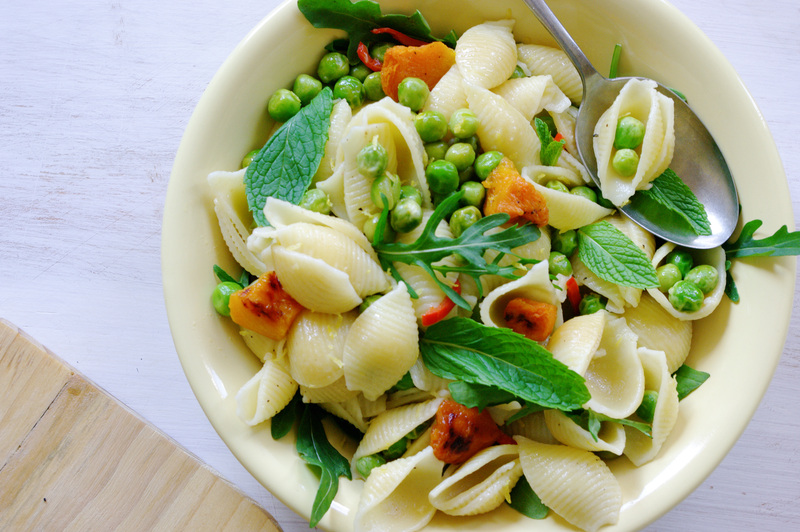 Return pasta to the pan, add peas, pumpkin, lemon juice, lemon rind, rocket, mint and season with salt and pepper to taste. Divide pasta among bowls, garnish with remaining mint springs and serve. Certainly not a boring vegan dish. Delicious!